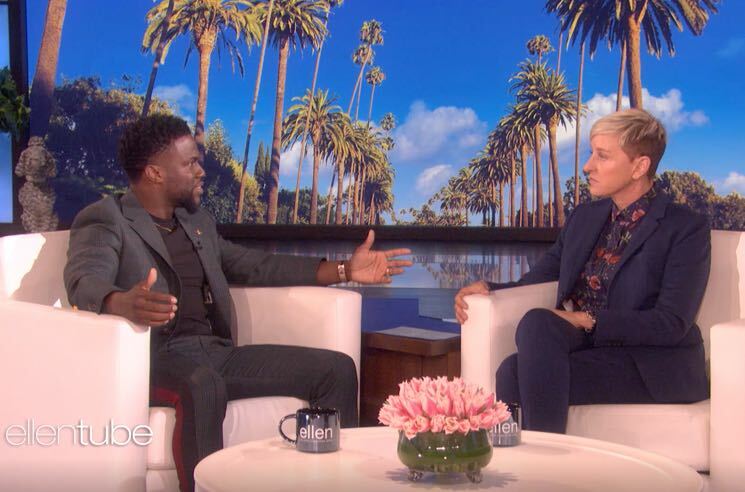 Kevin Hart is considering reclaiming his gig as the 2019 Oscars host, following an appearance on Ellen earlier today. During an interview segment, talk show host (and former Oscars host) Ellen DeGeneres told Hart that she had spoken to the Academy and they had said, "We want him to host, whatever we can do, we would be thrilled, and he should host." Hart seemed reluctant to reclaim the job, telling DeGeneres, "It's tough for me because it was an attack, a malicious attack on my character, to end me." She replied, "They will win if you don't host the Oscars. You can't let them destroy you because you have too much talent, and for them to stop you from your dream, from what you want to do, what you have the right to do, what you should be doing. Don't let those people win, host the Oscars. That's why they [the Academy] haven't found another host, because they are secretly hoping that you would come back." After much prompting from DeGeneres, Hart admitted, "Leaving here, I promise you I'm evaluating this conversation. Let me assess, just sit in the space and really think, and you and I will talk before anything else." Hart stepped down from the role just days after getting it, as online backlash grew due to previous homophobic jokes and tweets from the comedian. He later apologized for his "insensitive words from my past," but only after initially rejecting the Academy's request to do so. Much of the initial backlash against Hart was instigated by a bit from his 2010 special Seriously Funny, in which he declared, "One of my biggest fears is my son growing up and being gay." A number of since-deleted tweets that saw Hart using homophobic language were also dragged back into the spotlight after he was announced as host. One screengrab revealed a 2011 tweet that reads: "Yo if my son comes home & try's 2 play with my daughters doll house I'm going 2 break it over his head & say n my voice 'stop that's gay." In 2017, Hart also generated controversy with his opening monologue on Saturday Night Live, which many viewers deemed sexist and criticized for perpetuating gender stereotypes. Watch the interview clips on Ellen below.